With the Associated Press’ (AP’s) release last week of email correspondence between anti-obesity non-profit GEBN and Coca Cola executives, yet another round of media frenzy confronted the beverage giant. The controversy began when Yoni Freedhoff, MD an obesity expert at the University of Ottawa and a HealthNewsReview.org blog contributor, contacted the non-profit about funding and learned that Coca Cola contributed an initially undisclosed $1.5 million in 2014, to launch GEBN. Coca Cola’s chief scientific officer, Rhonda Applebaum who was not made available for NY Times interview, had been active on GEBN’s behalf, on Twitter. Applebaum, who laid out the corporation’s “Balance the Debate” strategy at a 2012 sugar industry conference presentation, noted that by engaging scientists, collaborating with them to develop the science and educating the public using evidence-based science, the industry would be able to “balance the debate to address the negative, advance the positive.” Coke accepted Applebaum’s retirement request after the emails, which documented her early CEBN management, became public last week. Redirecting the association of sugary drink consumption and higher obesity and Type 2 diabetes, health experts contend that Coca-Cola is using CEBN to convince the public that physical activity can offset poor diet choices despite evidence that exercise has only minimal impact on weight, relative to calorie consumption. “The message is that obesity is not about the foods or beverages you’re consuming, it’s that you’re not balancing those foods with exercise,” Dr. Freedhoff of the University of Ottawa said. While Coca-Cola executives provided executive-level responses to each throb of the frenzy, they have been far from expressing true contrition and more patronizing, if caring, plays taken from Applebaum’s “Balance the Debate” playbook. In an August 2015 Wall Street Journal op-ed, CEO Muhtar Kent addressed the concern that it puts stockholder interests ahead of its consumers: “By supporting research and nonprofit organizations, we seek to foster more science-based knowledge to better inform the debate about how best to deal with the obesity epidemic. We have never attempted to hide that. … However, in the future we will act with even more transparency as we refocus our investments and our efforts on well-being.” In addition to the launch of its “Our Commitment to Transparency” microsite that tracks research partnerships and funding activities, Kent indicated additional steps being considered might include creating an oversight committee as well as providing more communities with product options that include less sugar and fewer calories. After the AP email excerpt publication last week, Sandy Douglas, president of Coke North America further addressed Coca-Cola’s ongoing efforts engaging public health community individuals. “We will continue to listen and learn. We will do so because we care,” Douglas said without describing timeline or project specifics. ”Stressing the company’s sincere desire to respond to public concerns over the CEBN funding controversy by noting “This is not a PR stunt for us,” further noted that Coke overconsumption is not the company’s goal. “If folks are saying the moderate consumption of our beverages is causing obesity, then we’re going to argue with that, because it’s not true,” he said. CEBN partner The University of Colorado School of Medicine and CEBN, has agreed to return $1 million of Coca-Cola’s grant because of misperceptions over the intent of the gift while Coca-Cola has indicated it will redirect those funds to the Boys and Girls Clubs of America. Additionally, the corporation has ended annual sponsorships with the Academy of Nutrition and Dietetics, the American Academy for Pediatrics and the American Academy of Family Practice as a part of its funding review related to the CEBN controversy. Do you think Coca-Cola has taken sufficient steps to restore a trusted place in the public health policy debate concerning obesity prevention? Join the conversation, in the comments below. This week, I found myself launching a Unilever-promoted Upworthy video, enticed by the headline, “They ask these couples a question that is usually none of our business. But then they show the video.” Although I never learned who “they” are, and in the Upworthy 2:55 minute video version never see the expectant couples’ reaction to the video command “Breathe calmly and bring your child into this world,” I knew I was watching storytelling, at its most intense. The Unilever video, which has a longer 4:25 minute version on the Unilever YouTube Channel that includes more violent war scenes, relieved parent video-watch reaction and Unilever, Dove, Knorr, Hellmann’s, Lipton and Ragu logo close, is one of several promoted Unilever Project Sunlight videos available on Upworthy’s Unilever Section after the two organizations entered into a 2014 native advertising agreement. According to Upworthy’s co-founder Eli Pariser, “Unilever’s leadership in moving to improve child welfare and contribute to a more sustainable world made them a strong fit for this [native advertising] program. The heart of [Unilever’s] Project Sunlight matches several of the top topics our audience voted to see more of in 2014. We look forward to working together to bring more attention to young people who are making the world more sustainable.” Upworthy has earned $10 million from its native advertising agreements that include Unilever and Starbucks. For Unilever, the Project Sunshine Series quickly garnered 25 million total impressions from 1+ million unique visitors, while social sharing generated similar better-than-expected results. Although I initially enjoyed Upworthy posts on my Facebook timeline, I was an example of one of the 88 million 2013 viewers to stop visiting as of June 2015, when viewership declined to 19.8 million. Even though Upworthy includes a subtle, light-colored font disclaimer at the top of sponsored content pages, the site’s algorithm and design make it easy for a visitor to miss the distinction between Upworthy editorial content and a brand’s sponsored posts, sponsored curation and content consultation messaging. For me, the extra time commitment to evaluate brand vs. Upworthy editorial content caused me to stop reading: I no longer felt inspired by the content because I began not trusting its truth. According to a 2014 Contently survey of native advertising more broadly, 2/3 of respondents felt “deceived” after learning a given article or video was sponsored while 59% indicated that a news site loses credibility by publishing sponsored material. Although Upworthy’s initial partnership with brand content sponsors has been a clear revenue success for them, their mixed results in 2015 viewer traffic combined with general sponsored content viewer avoidance and unfavorable rating, Web publishers should venture into native advertising carefully. However, given the 41% 2015 global increase in ad-blogger software that caused an estimated $21.8 billion loss in blocked ad revenue, eMarketer expects native advertising to reach $8.8 billion by 2018, up from $4.3 billion in 2015. While shopping at JC Penny early this year, my routine Women’s Apparel route to Home Furnishings was unexpectedly blocked by an enclosed shopping area distinguished by a darker-light ambiance and music. Realizing the department store, like many brinks-and-mortar retailers had experienced financial performance issues due to stagnant sales, my first reaction was a fear that perhaps JC Penny’s had sold floor space to one of my least-favorite retailers like Spencer Gifts. To assuage my concerns, I ventured around the corner and entered through the mini-store front. Not familiar with the name Sephora but finding large colorful cosmetic displays, a Beauty Studio and lots of glam images, the new space felt very “JC Penny’s-ish,” enough to dissuade my fears so I could continue on to my bedsheet purchase. Later, I discovered my local mall’s JC Penny’s store was one of 500 other Sephora store-within-a-store locations, a move that has proved profitable for the troubled retailer while extending France-founded Sephora bricks-and-mortar in the US to a 12% US beauty market share. 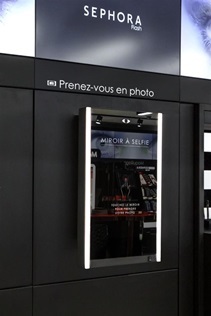 The Sephora Flash Boutique selfie mirror that allows customers to examine their newest Sephora-look while allowing them to share the results over their social media channels. Sephora brings its low-pressure, consumer empowering, leisurely hands-on consumer premium product testing to 3,000 sq. ft. floor plans, it recently opened its initial smaller 1,000 sq. ft. Flash boutique concept store at 66 rue de Rivoli in Paris, set to become ultimate connected consumer experience allowing them to shop 150 beauty product brands. Sephora’s Flash Boutique is its first blended physical and digital marketing channel offering that gives them immediate physical access to best-selling products while offering them combined purchase, digital shopping cart access through various tablets, terminals and digital display shelves to the company’s full 14,000 product-line. The concept offers specialized technology experiences like a selfie-mirror that allows customers to view the results of their own product-testing or the use of the virtual make-up artist applications that gave personalized step-to-step guidance on make-up contouring, while providing store visitor phone-charging stations. “We’re completely focused on making shopping more efficient, intelligent and fun for our clients, according to Julie Bornstein, chief marketing and digital office for Sephora. Sephora’s penetration of digital-to-physical retail sales is double that of the prestige beauty industry, driving sales for the retailer. The store’s new discovery tablet displays help customers explore trending beauty looks and leisurely self-test new products. Technology innovations include the company’s existing Sephora-To-Go mobile app for iPhones and its augmented reality features that allows customers to interact with content based on nine popular beauty brand founds as well as opt-in loyalty and birthday club in-store personalized beacon alerts. 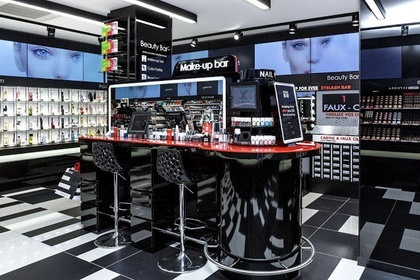 Since beauty and cosmetic products are best-suited for in-store testing before purchase, Sephora’s boutique strategy is to make the in-store experience sufficiently eventful that customers shun online replenishment from other retailers through Sephora’s digital on in-store shopping channels. I appreciate retailers who beyond the smart phone to innovate disruptive physical-digital shopping experiences that provide consumers with “purchase now” options as well as online purchase for home delivery or store pickup. New Sephora Flash Boutiques are expected to launch world-wide in the near future: Would you like one to open near you? Tell me more, in the comments below.